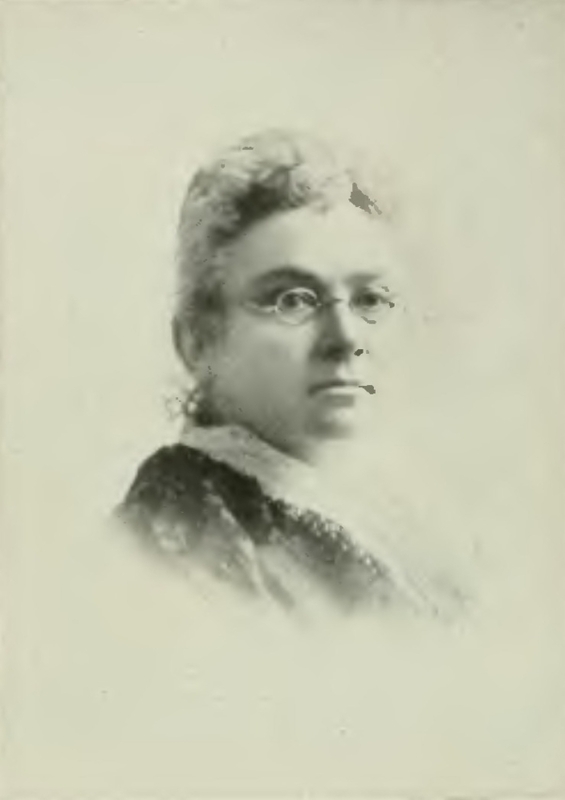 Emily Howard Stowe was a great Canadian. She was the first female doctor to practice in Canada and she and her daughter Dr. Augusta Stowe-Gullen, spearheaded Ontario’s suffrage campaign for 40 years. Hell, if two great women can fight for the right to vote like they did, surely the rest of us can honour their legacy and get up off our asses and vote. These two doctors would be disappointed – disgusted – at Ontario voter turnout over the last 40 years, which had an embarrassing high point of 66% in 1977 and a low of 48% in 2011 (see chart). And most municipalities are worse. To be clear, I am, first, talking to only half of you, the half who don’t vote, don’t give a damn or have resigned yourselves to the bottom of the democracy barrel. Those of you who don’t have the right to lick Dr. Stowe’s boots. Those carping critics who talk and don’t do, who complain everyday about how governments screw them but can’t spend one hour, on one day, every four years, to actually do something that, at the very least, shows you give a damn. Those who are too busy and too cynical, but who enjoy the rights and benefits of what doctors Emily and Augusta Stowe fought for. Those who aren’t interested in standing up for a cause. Those who are void of any sense of obligation or duty. New beginnings start with those who do vote. And it requires more than just voting. We need to take on additional duties, beginning with getting the disconnected non-voters out to vote. At least half of them. That could generate a 75-80% turnout. So true. ” … partly my fault.” Don’t we wish all citizens living off the benefits of democracy would see their failure to vote as their fault. Mildred also said, “… people have died and gone to prison and all sorts of things for the right to vote. 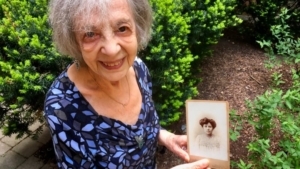 It’s important that you vote.” She’s grateful to Emily and Augusta Stowe and yet, half of us are not. We must do more than just vote, even if we do get 75-80% turnout. As proffered 150 years ago by Henry David Thoreau, we need a commitment to civil disobedience, to using our individual “influence.” With the state of democracy in serious decline, from Trump and Kavanaugh to Ford and Brocanier, we need action, not just shouting and tweeting from the sidelines, like a bunch of bad-mouth sports fans. Thoreau, best known for his famous work, Walden (1854) also wrote Civil Disobedience, a timeless, political essay (9,300 words), in which he reveals why he was such a renown figure in 19th century social and political thought. Central to his life were his principles regarding the excess of materialism in society and authoritarianism in government. In Civil Disobedience he articulates the ineptness and injustice of government. He was a true conservative, claiming, “That government is best which governs least.” He suggested that each person’s conscience should override allegiance to egregious laws perpetrated by the State. He would have been repulsed by US Senators pushing Kavanaugh through; appalled by the “notwithstanding” foolishness perpetrated on 2.8 million Torontonians; and disgusted by a mayor who claimed “vocal minorities” were to be ignored. Thoreau, a vocal minority of one, would, today, be a leader of an active, disobedient citizens’ group. The best place to start is at home – in our communities, in municipal elections – where the seeds of a healthy democracy emerge from the friction between the elected representatives and the people they represent. 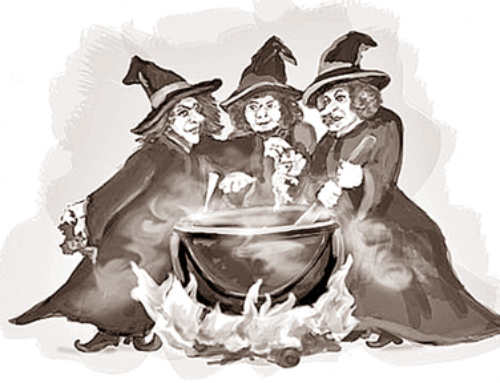 Governments, left to their own devices, become an island onto themselves and a breeding ground for incestuous attitudes and autocratic leaders. It’s self-evident in almost every community from Cobourg and Port Hope to Toronto and every Springfield in America (maybe even Homer Simpson’s hometown, inspired by Springfield, Oregon). As is currently the case, our politicians are put in office by a minority of voters. It’s nearly always less than 30%, often much less. So there is no basis for their claim that they have a mandate or for them to dismiss the interests of “vocal minorities.” They represent a minority. If we expect to truncate the decline of democracy, we need to significantly increase two facets of local politics: 1) Turnout; and 2) Civil disobedience. In the Ontario municipal elections on October 22, 2018, we need to set a clean slate in order to incite the change required. We need a large turnout and, subsequently, many more citizens’ groups providing friction and civil disobedience. It’s time to make Henry David Thoreau proud. Inherent in change is a strategy of voting the incumbents out – wherever possible. This is not ignoring the good things they’ve done – of which the pros and cons are debated ad infinitum – rather it’s realizing that by association with the past, they are an encumbrance on the future. The incumbents are part of “the system,” part of perpetuating the status quo, when what is needed is “new.” We need new vision, new aspirations, new ideas, new policies, new programs … new leaders. Not the same old, same old. Before trying to fix the leadership problems infesting democracy at the top – Trump, Kavanaugh, Trudeau, Ford – we should fix the problems closer to home. 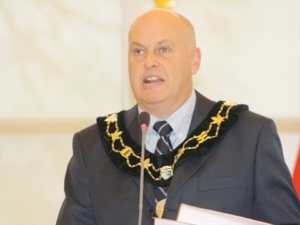 Recently, departing Cobourg mayor, Gil Brocanier, exemplified the recurring small thinking of small minds that profess to lead a democratic process. 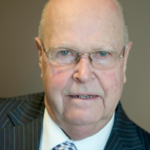 What Brocanier said in his parting speech to council (view short segment) represented everything Henry David Thoreau, Mildred Margulies and most us find odious about our governments. Like Trump, Brocanier, despite his accomplishments, couldn’t stop from putting his foot in his mouth and exposing his lesser side, his small-minded approach to community building and his limited understanding of real leadership. In addressing the out-going council, he advised them, “to ignore small vocal minorities.” First of all, that’s bad advice. Good leaders never ignore anybody and they know minorities can be extremely important and effective. In fact, most achievements are started, and led, by minority movements. Secondly, he was referring to his fellow residents who he characterized as, “chronic malcontents.” That’s a terrible comment from a chronically small thinker. Petty. Then he stooped even lower and said, “if you’re so discontented here in Cobourg, why don’t you just leave?” He sounded like a malcontent adolescent. This man, who has been mayor for eight years, acted like an insecure bully issuing one last barb from his bully pulpit. 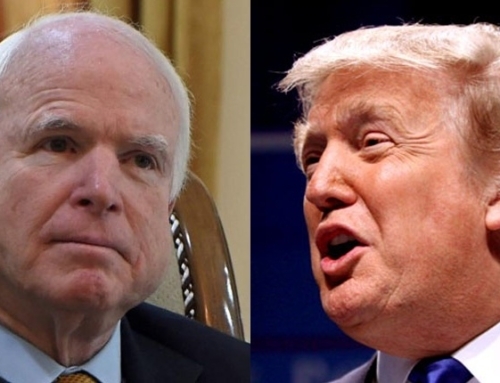 It’s unfortunate, but revealing of his character – the lack thereof. The only accurate thing he said when speaking about “vocal minorities” like the Cobourg Taxpayers Association was, “I just don’t understand.” Now, that is true … he doesn’t understand. What he needs to do is read Henry David Thoreau, a man who did understand. Any leader who is not capable of understanding is certainly not capable of leading. “‘Your Worship’ is historically used as an official way of referring to Mayors. Unfortunately, it is increasingly being seen as being over-the-top. Praise now is seen as needing to be earned, rather than automatically given. Mayor Brocanier was initially welcomed, but became increasingly erratic and unwilling to listen to citizens. He developed a very sharp tongue to respond to people with alternative ideas. His critics are still proud to be Cobourgers, but should not be expected to continually praise the Mayor.” – Greg H.
Of course, there were supportive comments for Brocanier – and he has accomplishments, but that’s not the point. Many people can say of bad behavior, “that’s not the person I know” (e.g., Bill Cosby, Bret Kavanaugh, Gil Brocanier), but that doesn’t negate the fact that it is “the person somebody else knows.” Warren Buffett once said, “You can take twenty years to build a reputation and lose it in a minute.” Regardless of how many good things and supporting comments are put forward for someone like Brocanier, it does not erase the deeper defect, the limited thinking that exemplifies his true self. His comments should give everyone pause, especially if any of the incumbents who he was “advising,” actually intend to heed his flawed remarks. They should be asked if they think what he said was acceptable. It’s sad that in departing from the highest office in a community, a mayor like Brocanier has to go low, poke a petulant, irresponsible, pointy stick in the eye of the people. Unfortunately, we’ve come to expect this type of bullying behavior from Donald Trump; we’ve watched Judge Bret Kavanaugh’s angry and defiant attitude be accepted; and we’ve seen Doug Ford’s ruthless and autocratic form of politics ignored. So why should we be surprised when a mayor is dismissive and disrespectful of citizens … right down to his last words? By the way, Brocanier is not alone. 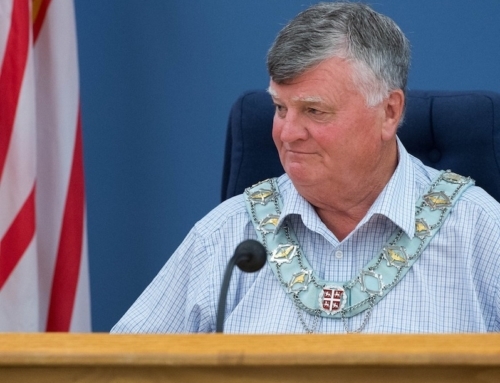 Other small town mayors (e.g., Marc Coombs, Mark Lovshin) practice similar contempt and scorn for citizens, and they’re often enabled by the silence of fellow council members who fail to stand up and condemn them. Just as they’re enabled by the “silent majority.” Because silence insidiously undermines citizens’ rights, and by not demanding more from our elected representatives, makes a mockery of any code of conduct. If we aren’t part of the change, we’re part of the status quo and enablers of abuse and inaction. Yes, change is hard and it takes time, but we have to start. The “Me Too” movement, started by Tarana Burke in 1997, is a model of what civil disobedience can be and can do. Lasting change starts in the kitchens and on the front porches of homes, with people chatting about the underlying truths in our society, and about becoming part of a “vocal minority,” and then a movement. We are enablers of the bad behavior of Trump, Kavanaugh, Ford, Brocanier, Coombs, et al, as long as we put up with it by not voting, not pushing back, not being a vocal minority, not voting to change the status quo; and not understanding the importance, power and necessity of “civil disobedience.” And by not persevering. The frontline of defense against the abuse of power and loss of community are citizens’ groups. They are the foundation of civil disobedience and the catalyst to change. They are the champions of scrutiny, the enforcers of accountability. They are imperative. Example: The Port Hope Citizens Association has developed a robust strategy to call their elected officials to account on a quarterly basis, and recently questioned a clandestine $750,000 purchase. Every town across the country needs more of these organizations. 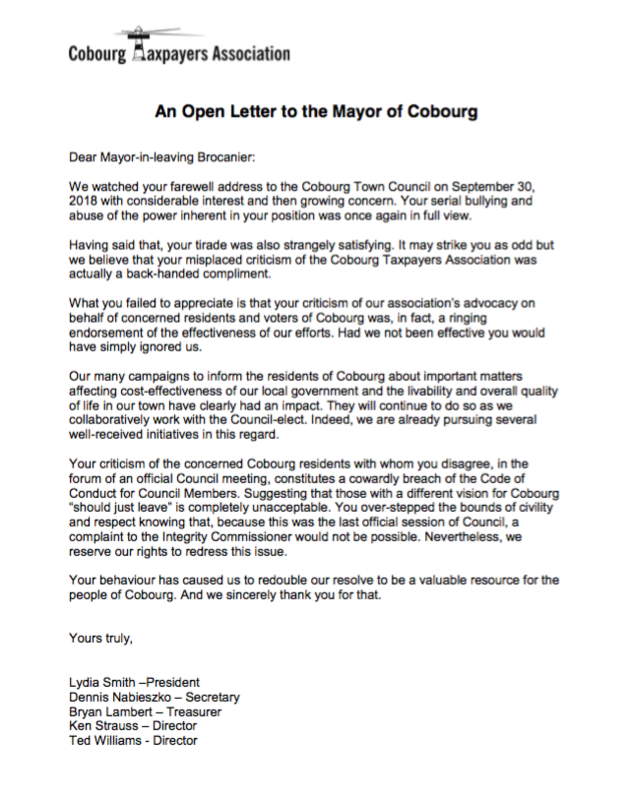 As far as “mayors behaving badly,” one group that did not put up with such behavior was the Cobourg Taxpayers Association. 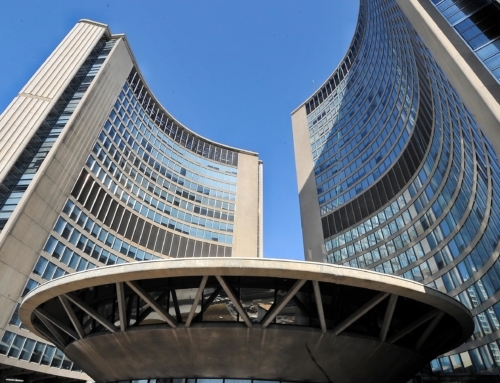 They wrote a letter in response to Mayor Brocanier’s ill-advised words. They took the high road and a position of leadership that’s required in a community that wants to build a foundation on the strength of its citizens, not the weakness of its politicians. 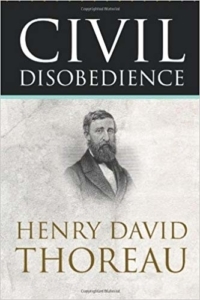 May the new mayor of Cobourg, and all the candidates in all 444 municipalities in Ontario, plus the United States, read Henry David Thoreau’s Civil Disobedience. And might I suggest, as additional reading for all public servants, the book, I’m Right and You’re and Idiot by James Hoggan (see earlier blog: Communities are dying from a lack of public engagement, aided and abetted by toxic public discourse). Emily Howard Stowe would simply ask: Vote, and make sure you get at least one non-voter to vote. And Henry David Thoreau would ask: Support your disobedient, vocal minority, citizens’ group. Apparently, Mayor Brocanier responded to the CTA with a lengthy letter. I don’t know what he said but I can assure you there is nothing he can say to rectify what he already said. I watched the video of council proceedings and there was no misinterpreting his comments. You can’t rationalize or spin the black and white of his words or the reality of his attitude. Doubling down and pushing back to explain himself further exposes what Eleanor Roosevelt called “small minded” thinking, and highlights the type of event in which insecurity and “average minded” thinking is rooted (as it does with Trump, Kavanaugh, et al). He should have taken the high road, but, of course, if he doesn’t know where the high road is, he can’t take it. I agree with the necessity for everyone to vote in this Municipal election, since the polling booth is now their home, there is no excuse not to vote. Not voting says that voters are not interested. But as you so ably described in this article, they will always complain when things don’t go the way they want. @Brian: Thanks for your comment. Democracy, politics and citizens’ groups are about differences and what Thoreau called, “friction” and “civil disobedience.” Politicians should not cast aspersions on ANY group – look how it has divided the US. Rather they should wade into controversy and welcome opposing opinions. No politician worth their salt should duck criticism, whether it is from a group of one (read the book “A Majority of One” by Sidney Harris written in the 1950s) or a “vocal minority.” Unfortunately, too many incumbents just pay attention to the “big” groups, like well-funded lobbyists and deep-pocket corporations (e.g., Cameco). Change does not come from ignoring anybody, or from an ignorance of all views, that just perpetuates the status quo, when what we need is … as I said, new ideas, insight and leaders. Real leaders listen – to everyone! Just to set the record straight, Port Hope Citizens’ Association has several hundred households as members ( not individuals, households in both the Urban and Rural Wards) It seems ironic that Mr. Coggins is attacking an organization fuelled by volunteers who have spent many days planning, preparing for and leading an All Candidates’ Meeting for the benefit of both the Candidates and the Residents of Port Hope. Equally perplexing is the fact that Mr. Coggins is a resident of the Urban Ward and yet has chosen to run in the Rural Ward. As Brene Brown said, “Constructive criticism is when people take ownership of their ideas” in the interest of furthering the conversation. This is when criticism and opposition are an important part of political debates. 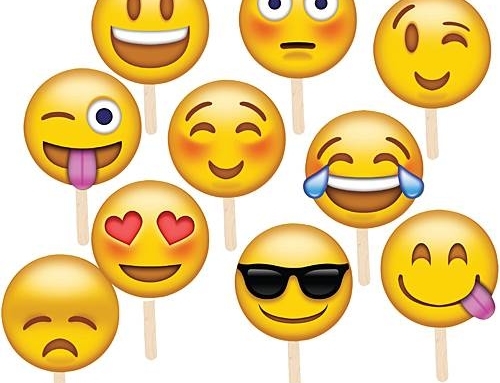 But when criticism is not factually based, it is divisive, counterproductive and becomes nothing more than carping criticism – not to mention dishonest. Normally I’m in agreement with you David. The sad fact is that democracy is disintegrating before our eyes – and not just because of low voter turnout. Municipal elections are increasingly going online, and this spells the end of democracy. For all its flaws, representative democracy USED to be such that voters had a high degree of certainty that their votes actually counted. Today we have electronic elections run by private corporations whose sales pitch is “convenience” and “accessibility” but not a word about hacking, security, reliability or transparency. Gone is any semblance of casting a secret ballot (your PIN is used to identify you), of having a verifiable paper trail to physically confirm how votes were cast, or doing a recount should doubts remain. Democracy has now been reduced to forcing the public to have blind faith in what a private corporation tells them.